Chris Hadfield is referred to as “the most famous astronaut since Neil Armstrong” and is internationally acclaimed for making outer space accessible to millions and for infusing a sense of wonder into our collective consciousness not felt since humanity first walked on the moon. He is a retired Canadian astronaut, engineer, and former Royal Canadian Air Force fighter pilot. The first Canadian to walk in space, he has flown two space shuttle missions and served as commander of the International Space Station. 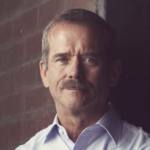 Colonel Hadfield’s many awards include the Order of Canada, the Meritorious Service Cross, and the NASA Exceptional Service Medal. He is a mentor of the Creative Destruction Lab’s Space Stream and an adjunct professor at the University of Waterloo. 1- The reduction of the cost of access to space combined with the miniaturization of electronics have opened the doors for smaller countries and private organizations to enter the space economy. There are now over 60 countries that have space plans. 2- The Canadian government must increase its spending on the space economy in order to build on our legacy investments to maintain our competitiveness in this new $300 billion market. 3- Canada needs to develop a long-term space plan that makes sense for a country of our large size with a small population, some of which lives in remote areas. Public sector involvement in space is required for initiatives that will continue to be non-profitable in the medium term. 85% of Canadians think that we should develop our space sector and are glad to see us as part of the new moon mission. So, we are in a good position to take advantage of the public support, and we need the government to continue to set a long-term space plan to show that the bureaucracy and the institutions are committed, and not just on a four-year electoral cycle. What are the forces that will drive the development of the new space economy? The global space market is worth over $300 billion, and it is growing fast. The new space economy, like a lot of different economies in the past, has been driven by technological change. In this case, a couple of major developments have allowed space to become a bigger factor in all economies. The first is improved access to transportation. Elon Musk and others have dropped the cost of access to space by a factor of 10 and they are in the process of dropping it even more. The other is the miniaturization of electronics, because of which things have become smaller and lighter. So, instead of sending up a gigantic geostationary orbit payload once a decade, we can now send out a constellation of tiny things every two years. Space technology is evolving at such a rate that it will be replaceable every two years. These two developments have opened the doors for smaller countries to enter the space economy and there are 60 countries that now have space plans. Artificial intelligence is also a big player in the future space economy since it means that not everything will need to be manually controlled. The world is much more self-aware and recognizes that we need the capability to measure and see ourselves in order to make informed decisions. Measuring and seeing ourselves is extremely difficult from the Earth’s surface; doing it from space is much more efficient. Is Canada competitive in the global space economy? Canada is extremely innovative and our 60-year long involvement in space has earned us a top-end reputation across the globe. We are a spacefaring nation and the third nation in space with the launch of our Alouette satellite in 1962. We were also the first nation to have a telecommunication system in space and the first to have a largely commercial-based radar remote sensing system. In terms of our human capital, 14 Canadians have been selected as astronauts even though we do not have our own rocket ships. Few countries in the world are even close to that figure. Canada’s stability, high standard of education, farsightedness and trustworthiness have led to our high reputation and success in space. Our adherence to the rule of law also makes us a good partner in long-term projects. However, if we analyze space investment as a percentage of Canada’s GDP in comparison with other OECD countries, we have slipped from the 8thto the 18thposition between 1992 and 2018. That is not a direction we want to go in, especially since the size of the space market is increasing. From 2010 to 2015, global space revenues increased by 18 percent, but Canada stayed flat because we have not invested and built on our legacy of investment from the ‘60s, ‘70s, ‘80s, and ‘90s. What should be the balance between the public and private sectors in the future of Canada’s space economy? If we consider government investment in space, the G7 countries spend on average 0.5% on civil space activities. Canadian public investment in space is 60% lower than that. So, we are setting ourselves up to diminish our presence and opportunities in the new space economy in that sense. But the new space economy has dramatically lowered the capital required to enter it. If we can reduce the cost of space launch low enough, space will no longer be the purview of enormous and very wealthy organizations like governments or philanthropists. There are already dozens of private ventures trying to land on the moon without government money. It is a great step forward that in the last budget Canada committed to be a partner in the Lunar Space Gateway. Public sector involvement in space is required for initiatives that will continue to be non-profitable in the medium term. 85% of Canadians think that we should develop our space sector and are glad to see us as part of the new moon mission. So, we are in a good position to take advantage of the public support, and we need the government to continue to set a long-term space plan to show that the bureaucracy and the institutions are committed, and not just on a four-year electoral cycle. For example, Telesat is putting up a constellation of communication satellites, but they are under extreme competition from SpaceX and others looking to use the high ground of space for digital communication. We need a Canadian space plan or strategy that makes sense for our country. We are a huge land mass with a very small population. Many of our people in the North get their data through the satellites we have put up. Remote sensing is really important not just for our sovereignty, but also for understanding our own resources. The amount of data that’s going to be pouring down from space to be interpreted and retransmitted will be overwhelming. We are pioneers of remote medicine and tele-robotics, but look at how we take care of our 631 First Nations in terms of medical care. Using technology to distribute information and remotely deliver skills could be both developed and delivered as part of a space policy. How can we encourage disruptive innovation in Canada’s space economy? Firstly, we have to open space up to market forces to drive significant innovation. Secondly, we need more avenues that connect science and business such as the Creative Destruction Lab (CDL) in Toronto. In the five years that CDL has been running, it has graduated over 200 companies and raised over half a billion dollars. Those companies’ valuations are now over $3 billion and growing. In 2017, we decided to set up CDL Space because it is a great time to start prioritizing innovation in space. Over 100 businesses applied for our first cohort and we brought 25 of them to CDL for our first cycle. Only a third of them were Canadian because we did not want to make CDL exclusively Canadian. The space economy needs access to capital and Canada has a great banking system that is progressing rapidly. We have a very stable and good legal system, but do not necessarily view ourselves as enormous international risk takers. That is why initiatives like CDL provide a good counter balance. Canada needs to build an environment in which each citizen can feel confident enough to take a bigger risk, and therefore, generate a bigger return. Between China and the United States, Canada is a pretty small entity, but that does not and should not limit our ambition. We are a spacefaring nation with 60 years of history and there is lots of room for us to engage in the space economy. But we need to be more willing to fail. If we are going to launch one big satellite every 10 years, our margin for failure is too low. The Rocket Lab in New Zealand has found the cheapest way possible to put things into orbit and it is trying to launch a rocket every three days so that it can learn more quickly. New Zealand is not exactly a heavyweight in the space business, but a lot of people think of New Zealand as an innovation nation. And nothing is stopping us from doing the same. How do you envision Canada’s future economy? Things are going to become more technical, not less. There is a lot of fear of artificial intelligence, most of which is driven by a lack of understanding. In order to continue to stay competitive in the global economy, we have to improve our digital literacy. You can no longer count on finishing high school having learned enough technical skills that will enable you to coast for the remaining 80 years of your life. Those days sailed a long time ago. Today, you cannot finish an undergraduate degree at 24 and expect to stay relevant your whole life. Everyone is going to have to go to school and return to school on a regular basis. We need to change our education model and we are in a good position to do it.